TAMPA, FL - JANUARY 13: Tampa Bay Lightning general manager Steve Yzerman speaks during a ceremony to retire the number of former Tampa Bay Lightning Martin St. Louis at the Amalie Arena on January 13, 2017 in Tampa, Florida. It seems unlikely he'd sign on with the Flyers, because it'd run counter to his desire to spend more time at home. Detroit Red Wings legend Steve Yzerman wants to spend time with his family in Detroit, but that doesn’t stop other NHL teams of dreaming. A report out of Philadelphia says the Flyers, who fired general manager Ron Hextall Monday, are looking at Yzerman as a possible replacement. 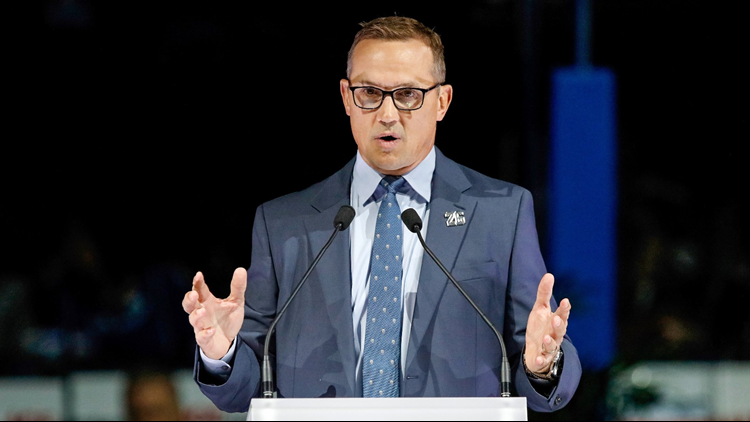 Yzerman, who captained the Wings to three Stanley Cups and won a fourth Cup as a member of the front office, resigned as general manager of the Tampa Bay Lightning before the season, and is contracted with the Lightning through this season. That won’t stop interested teams from putting out feelers, and the Flyers sound keen, but also realistic, about wooing Yzerman. “I spent some time in Detroit, and I know Yzerman a little bit," Dave Scott, the CEO of the Flyers' parent company, told Philly.com. "My sense is he's pretty committed to someday getting back to Detroit. I think his family is still there. He really put roots down there, and (Red Wings GM) Kenny Holland is getting to a point in his life he's probably going to do different things someday." Yzerman, 53, said at the time he didn’t know what he’d do beyond this season. But it seems unlikely he’d sign on with the Flyers, because it’d run counter to his desire to spend more time at home. The most intriguing aspect of Yzerman’s decision to step back in Tampa Bay is whether it’s a step towards him rejoining the Wings. General manager Ken Holland is signed through 2019-20, but potentially there could be a scenario where Holland moves into more of an advisor role, similar to what Jimmy Devellano did in the late 1990s, and Yzerman takes over the general manager role.